I've been looking forward to having a real Kölsch ever since I had the Australia beer porporting itself as a Kölsch. I loved the 4 Pines Kölsch, it was a delicious beer but, much like how Champagne must come from Champagne in France, Kölsch must come from Cologne in Germany. A Kölsch beer is characterized by it's pale straw colour and its distinct hops flavour, which is not particularly bitter. At the Kölsch Konvention it was decided that Kölsch was to now be brewed at precisely 11.3% gravity. The beer is served in Stange glasses like you see above with purists arguing that even the standard 200ml glass is to big as the beer quickly loses flavour once poured. 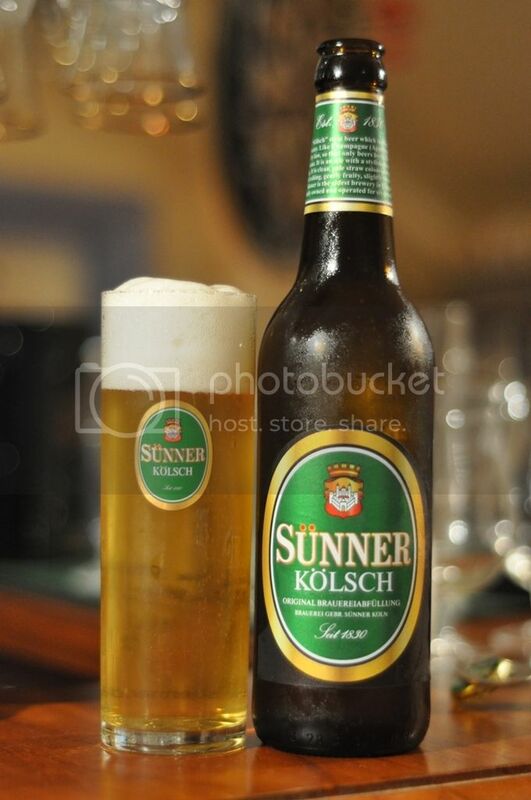 Sünner Kölsch pours just like the style promises, a light straw colour with lots of carbonation rising to a big fluffy white head. The head is brilliantly white and has amazing retention and lacing. This beer is sometimes described as the beer equivalent of champagne, and you can see why after looking at this beer. It looks good to me, and from what I have read this is exactly what the style calls for, an excellent looking beer! On the nose the beer is light and sweet. There are strong citrus flavours up front with mild smelling floral hops. I can also smell a honey-like sweetness with some slightly spicy hints. The beer is balanced beautifully with both major elements, the malt and hops, acting in perfect harmony with neither gaining the upper hand at any time through the smell. The taste is unusual and is probably not going to appeal to the average beer drinker. It's slightly sweet to start before strong grain and bread tastes comes through. The herbal hops are quite mild but turn to a light peppery flavour which tickles the tongue quite nicely. The mouth finish is nice and crisp with soft grass notes and a flowery taste. The beer is impeccably balanced and well made. Overall the beer is excellently put together, however I'm not sure I like it. The elements of the beer all sound good but it is slightly to sweet and the moderate to high carbonation puts me off somewhat. I don't know what to think of this beer, it's strange and I personally wouldn't drink it again. I can see the merits of the beer, but am not a big fan. It could be a refreshing summer beer and after trying more examples of the style I will decide whether or not I like it. Don't right off the style straight away, try a Kölsch if you see one.